Just because it was handmade... doesn't mean it was easy! January 18, 19 & 20th. All week $5.00 a yard on all fabric on the sale table. If you ever wanted to make a quilt and had no idea where to start, we have the solution for you. This 5 week... 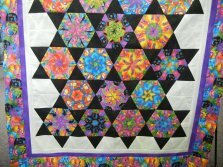 Yes 5 classes of instruction... is a comprehensive machine-piecing class that is geared to beginners and those wishing to improve their piecing skills. Choosing fabric, the right tool for the job and mastering the scant 1/4 inch are just a few of the skills you can expect to master. This trimming tool and fast 4 at a time flying geese and square in a square technique will have blocks flying onto your quilts in no time.